Subsequently extended to the current 15,956 square metres many trees have been planted, paths dedicated to the 15 Alpini from the Province of Treviso who were awarded a Gold Medal for Valour have been created and 2404 individual steel alloy memorial stones designed by master blacksmith Simon Benetton have been erected between 1972 and 2017 in remembrance of as many Fallen who are symbolically laid to rest in the “Forest”. The memorial stones in remembrance of the Alpini who died in the fulfilment of their duty are grouped in areas, beginning and ending on the two sides of the wooden Crucifix which was already there prior to the creation of the “Forest”, and each area has a section for each war. Each area is also further divided: first into municipalities in alphabetical order and then each municipality ranks the Fallen Alpini by their surname. The area behind the Votive Bell has been reserved for those who have Fallen after the end of the Second World War. Each memorial stone is inscribed with the name, surname, date and place of birth, detachment where served, and place and date of death of one of the Fallen. The adornment of the memorial stone represents the splinter of a grenade shaped like a cross¸ the splinter which broke the feather of the Alpino. Set in the greenery amongst the trees in the centre of the Place of Remembrance is the statue of “OUR LADY OF THE FALLEN” clasping a bunch of feathers to her heart, thus symbolically embracing all the Fallen Alpini remembered here. The statue donated by Mr. and Mrs. Altarui is the work of the sculptor Marcello Cagnato. On the sides of the main square by the entrance, before entering the winding paths, are the armorial bearings of the six Alpine Divisions which were operative in the Italian Army in many conflicts; on the left at the top is the “PENNE MOZZE” monument to the Fallen which is the symbol of the “Forest” and on the right is the “BOOTS” monument which is the remains of the monument to the Alpino erected in Bruneck in 1938 to commemorate the Fallen of the Pusteria Division in Eritrea and blown up by a charge of TNT on 2 December 1966 by the erstwhile South Tyrolean separatists. 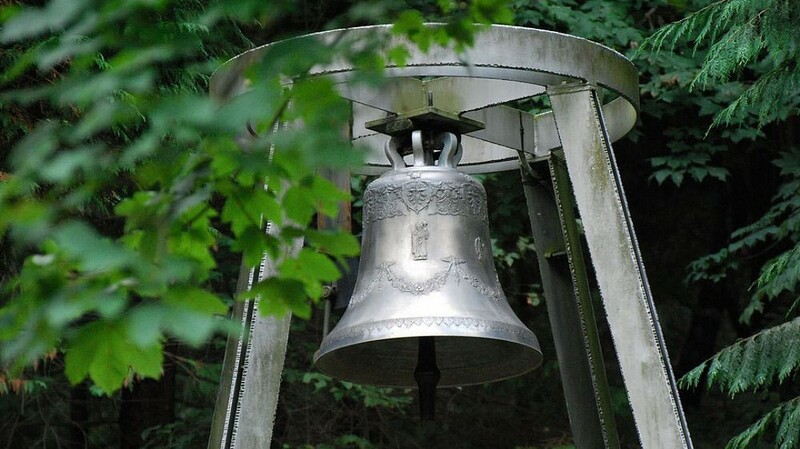 On the twentieth anniversary of the setting up of the Associazione Penne Mozze (Association of the Fallen) in 1988 the Votive Bell, donated by the Zechella brothers in memory of their father, was placed between the two monuments and every evening it recalls the sacrifice of those who rest in this place with its mournful tolls. As from 2002 the Italian Sections of the Associazione Nazional Alpini have started to honour their Alpini Fallen in the “Forest” by affixing their name plates to the TREE OF REMEMBRANCE. Other memorials and monuments placed along the paths are tangible signs that many Armed Services Associations have wanted to bear witness to their solidarity with the Alpini. In 2018, on the occasion of the Centenary of the end of the First World War, the name plates of the Associations which are members of the International Federation of Mountain Soldiers will be placed in the “Forest”. Starting with a rough idea originating in a tavern, picked up by people who were more interested in facts than ideas and then taken up and enhanced by great dreamers who were themselves supported by the enthusiasm and the work of the Alpini from Treviso, the “FOREST OF THE FALLEN” began to grow and with the passing of time it has achieved international recognition. * In Italian the Fallen Alpini are referred to as ‘Penne Mozze’ which means ‘broken feathers’ because they wear a feather in their hat. In English this is translated as Fallen which has exactly the same meaning although in the case of the monument on the square at the entrance this has not been translated. Throughout this translation Alpini is used instead of Alpine Soldiers.